If you’re struggling in your marriage, you need help now. If you pre-order the paperback copy of the book NOW (investment is $14.95), I will give you the digital version of not only this book, but also the 4 other books I’ve published in the Soulful Truth Telling series on love and relationships – all of which became #1 international best-sellers for free NOW. 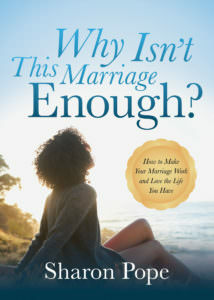 STEP 1: Click here to pre-order the paperback copy of the book, Why Isn’t This Marriage Enough? from Barnes & Noble. Be sure to grab the pre-order confirmation number you receive after check out. I’ve never given all of my books for free before, but I’ve also never seen my books on book shelves in major retailers before either!…which means I’ll be able to reach and help a lot more women struggling in their marriages. I’m thrilled that I get to share this with you and I hope that these books will help you get both the answers and the clarity you seek for yourself and your most important relationships. If you know someone that could benefit from one or all of these books, please share this with them.